One likes to believe that Bob Dylan was being ironic, not prophetic. But as is the case with most things Dylan, one is never sure. His reply was good for a laugh, and apparently only for its moment: Bob Dylan waited 37 years before appearing in a television ad for, and licensing his hit song “Love Sick” to, Victoria’s Secret, a 5 billion dollar global lingerie retailer. 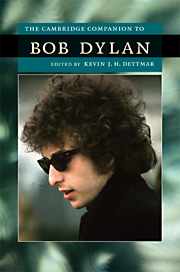 …much of Dylan’s earliest work – and many of his public statements – associated the market with corruption and exploitation. In an aside, it is perhaps telling that this year’s most talked about cable television series – “Mad Men,” a brilliant period piece that serves as an indictment of the American advertising industry of the late fifties and early sixties — featured Dylan’s classic kiss-off, “Don’t Think Twice, It’s Alright” in a season finale that spoke to the moral failures of the show’s central character, “Don Draper.” Draper, an aptly named advertising creative director straight out of Sloane Wilson’s Man in the Grey Flannel Suit (a novel that seems likely to have influenced Dylan’s anti-conformist rant masquerading as a song, “Ballad of a Thin Man”), embodies the advertising industry that reached its creative apex around the time that Dylan was writing his most evocative anti-marketplace songs. Part II of No Faith in the Market: Bob Dylan, Capitalism, and the Religious Right – now live!